Timely response of Railway staff has averted catastrophic failures. There should be a structured vigilance on rail tracks near coastal zones. The corrosion was probably caused by the discharge of sewage on to the tracks from toilets, they said. 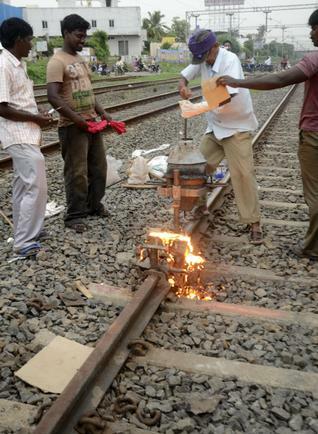 Southern Railway staff replaced a slightly fractured, highly corroded portion of a railway track on the main line near Chromepet railway station on Monday afternoon. Officials at Southern Railway said an employee noticed a minor fracture on the track on the main line (Egmore to Chengalpattu) a little past 1.30 p.m. A team of staff members and contract labourers sawed off the corroded track close to the railway level crossing (LC No. 26) and replaced it with a new piece of track for a length of 10 metres. The new track was subsequently welded. Except for the diversion of Pallavan Express on to a parallel main line, the repair work caused no disruption to rail traffic, officials said. Staff said they suspected the minor fracture had been caused after the passing of Vaigai Express around 1.30 p.m. or even earlier in the day after the movement of other long-distance or freight trains. The fracture apart, it was the corrosion, for a length of 6 metres that had worried them. The corrosion was probably caused by the discharge of sewage on to the tracks from toilets, they said.